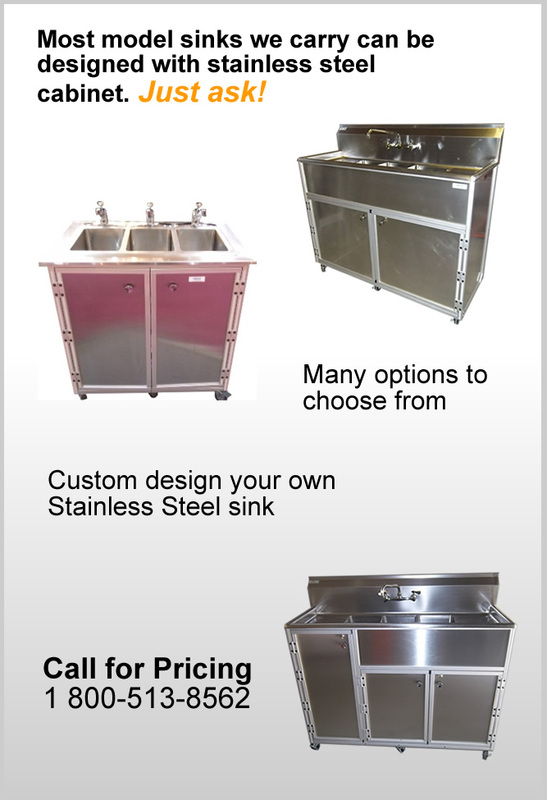 Our Stainless Steel Portable Sinks are top-of-the-line in both durability and style. The way it works: find a current model that you like and we will build it in stainless steel for you! It’s that easy! You can choose the counter top, the side panels or both*! All our sinks are self-contained and mobile in design. Most of our portable sinks are heated as well, and offer other customizable options such as different colors, adjustable heaters, goose neck faucets, foot pumps and more. Monsam Enterprises is one of the leading sources for the best selection of portable sink units, portable kitchen sinks, single sinks, double sinks, catering sinks, food service carts, commercial portable sinks and much more. Call us at 1-800-513-8562 to order yours today!